Ok, here's the thing. 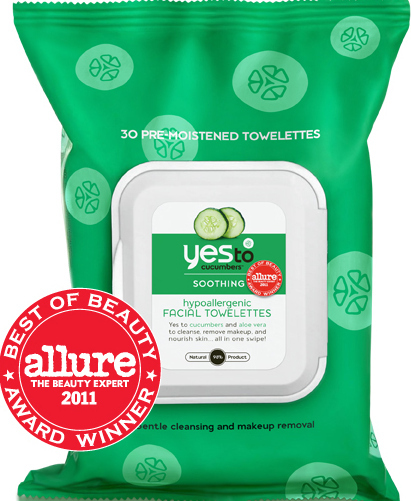 I had finally found some makeup wipes that were effective without irritating my skin. I loved them. Come to find out they've now been discontinued. GRR! What's a girl to do? Yes To Cucumbers Facial Towlettes, how I do love thee! These are effective at removing my makeup at the end of the day, yet they are so gentle. The formula itself is very gentle & doesn't burn or irritate my skin in any way, not to mention the actual wipe itself is super soft. I actually like these better than the wipes I was using before! The Yes To Cucumbers Gentle Milk Cleanser effectively cleansed my skin without irritating it. It's very gentle, as the name says. 'Nuff said. I have mixed feelings about the Yes To Cucumbers Calming Night Cream. First, the good. I really do love what this does for my skin. It's so soothing & my face feels so silky smooth & moisturized the next day. My skin had no issues with this whatsoever, unfortunately my sinuses did. It looks like all 3 products contain some fragrance. Whether or not it's just a masking fragrance I don't know. For some reason, the other products didn't give me sinus allergies, but this one did. However, that aside, it did leave my skin feeling smooth & moisturized. Plus, everyone has different reactions to things, so you may not have an issue at all. If you have sensitive skin & need something soothing & gentle, I'd say these are worth picking up. My skin loved these! Products were provided by a PR rep of the company, I did not pay for them. This in no way effects my opinions of the product.